Water condensation is caused by water leaks or moisture build-up in your air conditioning system. Some condensation is natural, but it just evaporate quickly without causing any problems. If the condensation lingers, it can leak out of vents and create stains in your roof and floor space, or allow mold to grow in the vents and spread throughout the house. You can fix most leaks with some home improvement work and parts replacements. One of the most important systems in your air conditioning unit is the evaporator. This system uses a coil that cools the fan blades to nearly the point of freezing. The air is passed over these blades, transferring its heat to the evaporator, and is blown back through your house, now much cooler. Along with heat, your evaporator coil also takes moisture from the air, drying it out. Your air conditioning systems is designed to allow this moisture to drip down from the blades into a drain that carries it away from your house. If the evaporator or blades stop working, this moisture can form pools and leaks instead, possibly flowing into your vents or lingering as condensation around the unit itself. 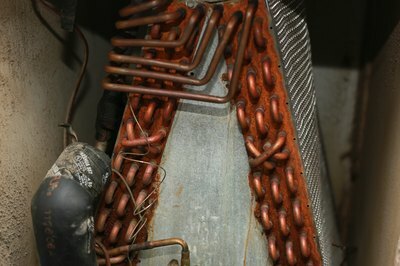 To pinpoint the problem, examine your evaporator blades to make sure they are clean and frost-free. Dirt can build up on the blades, affecting their efficiency, and water can stay on them too long and freeze, leading to problems when it melts later. If the blades are dirty, clean them off with a cloth and soapy water. Next, examine the drain line to see if there are any clogs. Clogs will lead to backed up water, causing similar problems. Remove any obstructions and clean the drain. If you notice leaks in your roof or basement, the condensation may be forming directly in your ductwork. This is often caused by temperature differences between the air outside and the air in the house, especially when the air inside is warm and attracts humidity, while the air outside is freezing. This causes condensation to line the inside of your vents. To stop the build-up of moisture, block off all return ducts that are only used for air conditioning, not heating (if they are used for warm air too, leave them open). Make sure you inspect the rest of your house, including your plumbing, for any leaks that could be dripping into the ductwork, as well. Many leaks can be solved by replacing or upgrading the ductwork. 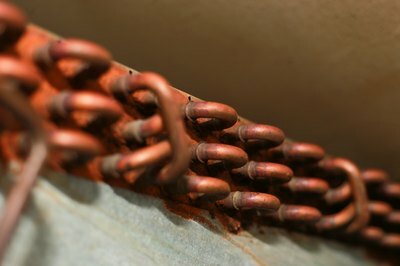 Old ducts can develop cracks, rust, or holes. If your ducts are sagging (perfect places for water to collect) or have structural problems, replace the section with new venting. You can also seal your ductwork with liners designed especially to seal off any cracks in ducts, which you can find at a local home improvement store. 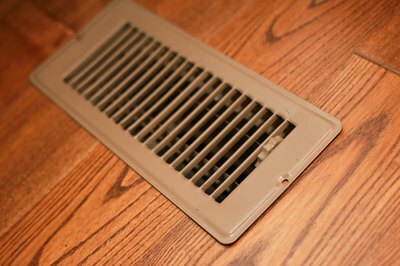 EPA: Should You Have the Air Ducts in Your Home Cleaned?